Lacing cards have loads of therapeutic advantages for young children. Kids use them for developing their skills and for learning. You can modify lacing cards to match the learning aims and developmental requirements of every child. With these you are able to work on fine motor skills, hand-eye coordination, language skills, mathematics, and many more. Pincer Grasp Development: Making the needle and thread move in different directions using a 'pad-to-pad' grip is a fine motor skill kids require for performing various tasks. A pincer grasp is required for picking up small objects such as beads, seeds, coins, and so on. Knowledge of Bilateral Coordination: Bilateral hand coordination is necessary when young children utilize the dominant hand as the tool controller and the non-dominant one as the assistant in certain skills which include writing, drawing, cutting using a pair of scissors, zipping a jacket, and buttoning a shirt. Motor Planning: This involves functional performance of a task that is seen with the eyes and done with the hands in order to finish tasks. Such tasks include walking around hindrances, mazes and cutting properly along a line. Hand-eye Coordination: This is simply the use of information seen through the eyes to coordinate and control the hands, in order to finish a task like writing and catching a ball. Scanning Visually: Lacing cards help children learn how to scan visually. Visual scanning helps children to be able to read, write and locate a specific colored item in a container full of similar items. Literacy: You can modify lacing cards to suit different learning needs of kids. Writing letters alongside the holes can help kids learn how to identify letters, recognize letters, and sound letters. It also helps them to know the alphabetical order of letters and many more. Mathematics: Writing numbers alongside the lacing holes can help children in identifying numbers, recognizing numbers, arranging numbers, multiplication, division, addition, subtraction, skip counting and much more. Using Tools: Manipulating a string with or without a needle can be good practice for functional tool use. Learning Life Skills: Kids get to learn to sew by using some string and a needle. There are a lot of lacing cards available in the market. You may find bright colored numbers, letters, shapes, animals and so on. Kids will tend to choose what they like. Fabricated lacing cards tend to be very steady, which is very useful. There are a lot of different materials you can utilize when making lacing cards. When making lacing cards at home, let your child help as he/she will get to develop the fine motor skills. You can make lacing cards out of foam sheets. Foam sheets are pretty versatile and can be formed into any sort of shape using cookie cutters or by drawing. Take some recycled objects like take out containers to create lacing cards. Transform them into any shape you like. Form sturdy lacing cards using plastic mats available in your home. Cardboard cereal boxes form sturdy lacing surfaces as well and you can shape them. Wallpaper scraps are great for creating patterns, seasons and multicolored objects. Take some plastic canvas and cut out different shapes. Use these to explore different ways of stitching and math as well. You can also utilize transparent office supplies such as binders and dividers to make a light table lacing prop. Furthermore, you can make use of family photos to make lacing cards. 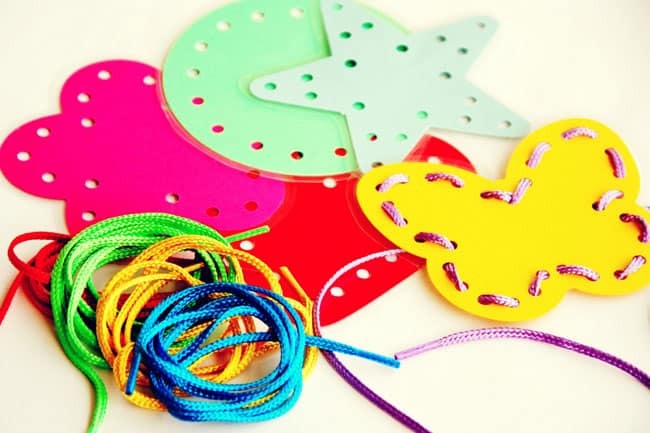 Home-made lacing cards are great and are very useful for your kids. Using lacing cards allows children to strengthen their small fingers and wrist muscles, and use their imagination as well. Some parents may not know the importance of carrying out lacing activities together with introducing young kids to coloring and writing. Lacing cards help kids master their pincer grasp, useful for grabbing objects (e.g. holding a pencil while writing). Furthermore, engaging in activities like these gives children a break from the monotonous work of tracing or coloring, and gives a vast range of movement that is useful. The kids get to know the work of their dominant and non-dominant hands. They are able to stabilize the cutouts while passing the thread through the lacing holes, which strengthens the developing fingers and muscles. This was it for now! Let us know if you have an idea to contribute. Ta-da!